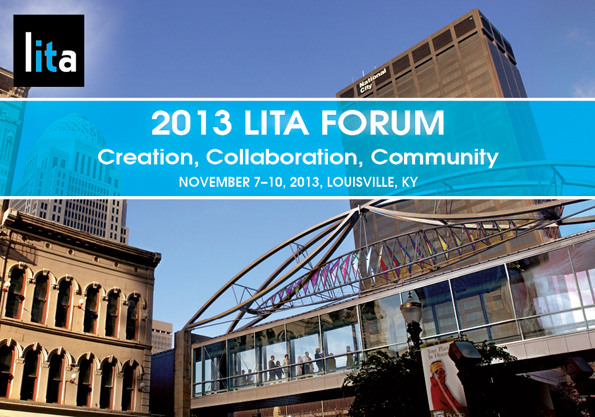 Registration is now open for the LITA Forum: Creation, Collaboration, Community. The conference will run from November 7-10 in Louisville, KY.
More than 30 concurrent sessions and a dozen poster sessions will provide a wealth of practical information on a wide range of topics. Two preconference workshops will also be offered; choose from Managing Projects. Or, I’m in charge, now what? presented by Rosalyn Metz of Wheaton College (IL) or IT Security for Librarians, presented by Blake Carver of LISHost. The 2010 LITA National Forum is going on right now in Atlanta, Georgia. Here are some good sessions and a poster paper dealing with collaboration. The next LITA national forum has several program dealing with cooperative technology. Panel presentation/discussion of a pilot project to move library management services and cooperative intelligence functions to the cloud. Using open source Omeka software and a variety of cloud-based tools and methods, we built a collaborative digital archive involving campus, community, and alumni to celebrate the University’s Centennial. An academic library’s experience moving from a static HTML site to a dynamic website using the open source CMS Drupal, and how this new crowdsourced, collaborative environment is impacting staff and users. Providing low (or no) cost, one-click installation and hosting services can lead to easier evaluation and more widespread adoption of locally-developed open source software applications. There are a number of programs on cooperation at the 2101 LITA National forum, “The Cloud and The Crowd,” will be held September 30 – October 3 at the Downtown Hilton in Atlanta. The upcoming LITA Forum has several program on collaboration. Starting in late 2007 the University of Alabama Libraries with a growing instruction program indentified a need for a more intimate setting for smaller groups of faculty and graduate students. At the same time, the University’s Faculty Resource Center needed additional space for its expanding program, particularly in a central campus location. Thus, a marriage of convenience was born. In the midst of planning and repurposing space in the Gorgas Library, a new VP-CIO arrived with a vision to expand the services available in this space. Needing a similarly sized space to institute an Access Grid node on campus, he recommended that we build out the room appropriately to add this capacity. This presentation will focus on the planning, specifications, implementation, and collaboration pay-off in other similar projects underway.